As I look back over photos from previous summers, I see many plants that have come and gone from my gardens as, year after year, I’ve attempted to find the right plant for the right place. In spite of much research, my best laid garden plans have not always been successful. Gardening is an ongoing battle to exert some small measure of control over Mother Nature, knowing all the while that said control will no doubt be fleeting. And while we struggle to familiarize ourselves with planting zones, soil chemistry, light conditions and the mysteries of composting, it all comes down to finding the ideal spot for each plant in your own unique microclimate. That’s why gardeners are always moving plants around. They’re trying to find the spot that most closely matches each plant’s requirements. And often there are particularly difficult spots that challenge our resourcefulness. For instance, I have a flower bed under my front window where the light is partial to full shade, and the soil is very dry due to the wide eaves overhead. It is bordered by the driveway, the house, the porch and the front path. I wouldn’t like to think how much money has been spent on plants that, in spite of my efforts, have perished there. I’ve tried annuals, perennials, shrubs, you name it. Parched and weak, the poor dears reach out for the sun, and fall exhausted across the front path where they suffer further indignity under the feet of passersby. If I had a shred of human decency, I would admit defeat, move everything out of there and widen the path. And while I’m busy trying to choose just the right location for my plants, that sneaky microclimate is subtly but surely changing. The full sun spot, where my daylilies revel in the heat, is morphing into a semi-shade garden as the trees grow and mature and cast broader shadows. The calm and cool full shade garden under the mountain ash is shifting to dappled shade as the tree ages and begins to decay. In time, that tree will have to be removed causing those shade plants to be thrust into full sun. It would seem that a gardener blessed with a strong back and a long life will be constantly be moving plants around until they end up right back where they started. Meanwhile every spring the nurseries bring in new plants for our perusal. It’s a very disciplined gardener who can resist taking home several new additions in that spring fever that hits particularly hard when you live in an area which experiences months of winter. There’s always room for one more plant. I can move some around, discard some under-performing varieties, give some to the neighbours, or if all else fails, dig another garden. In an effort to rationalize our purchases, we gardeners may sound like the black sheep of the family trying to explain away our actions while concerned relatives attempt an intervention to save us from ourselves. We may also fall victim to the latest garden fad and feel the need to incorporate it into our own display. Do you remember black mondo grass? Scree gardens? Xeriscaping? Every spring, the garden magazines are full of ideas for theme gardens, butterfly gardens, pollinator gardens, native plant gardens, etc. Those marketing people of the garden industry are expert at constantly tantalizing us. Whether it’s a breathtaking new hybrid, an exotic (i.e. not hardy in our zone – it’ll break you heart) species, or a fabulous new piece of garden art, inevitably we succumb and open our wallets. Gardening is supposed to be a relaxing hobby but truth be told, it is in fact fraught with stress. Your attempt to create a peaceful retreat from the workaday world will backfire. Dreams of traipsing through your garden, pulling a few errant weeds, morning coffee in hand, will shatter. You may have the latest gardening gloves, the snazziest garden hat and the sharpest secauteurs, but trust me, you are on a slippery slope. You are doomed. It’s no wonder Adam and Eve’s fall from grace occurred in a garden. Over the years, we expand our gardens again and again until one day it dawns on us that we are getting older. Each year, the weeding, mulching, fertilizing, edging and deadheading become increasingly taxing. That peaceful oasis has now become a source of stress and pain. And yet, we soldier on, feeling a sense of responsibility to nurture all those plants that we ‘adopted’. We become slaves to our gardens and in the end we have to pay someone to do the hard physical work that is now beyond us. And I have no doubt that some gardeners have even thought about how to provide for their plants when they are gone. I know that I’ve thought about it. What will happen to all my beloved daylilies when I’m not here. 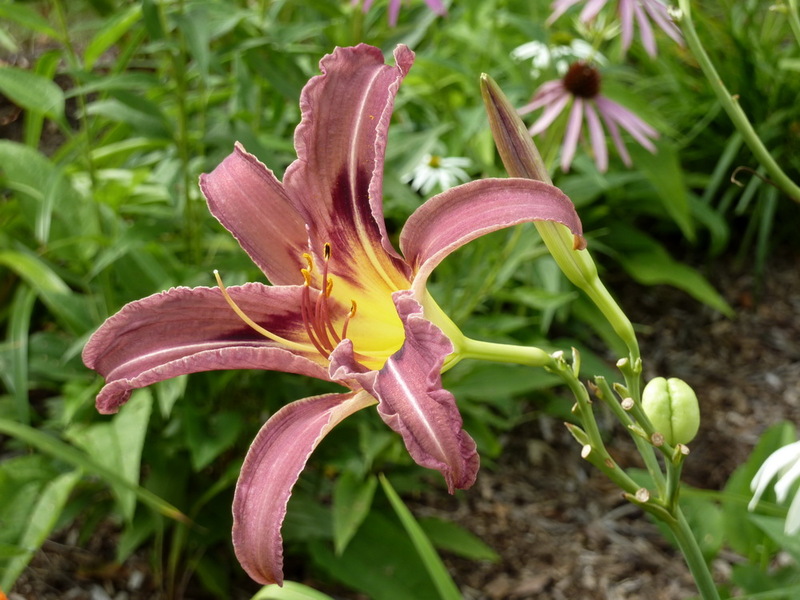 I know my son and daughter-in-law are not enamoured of gardening so I think the best thing must be to contact the Ontario Daylily Society and offer my ‘babies’ to a good home. Another interesting post. It’s so tempting to add another plant, or even another bed, isn’t it? We moved to a place with a smaller garden, but I can see that the time will come when we will reduce it. Gardens are work, but they are also good for the soul — even when we’re busy swearing at the weeds. That’s why we do it.